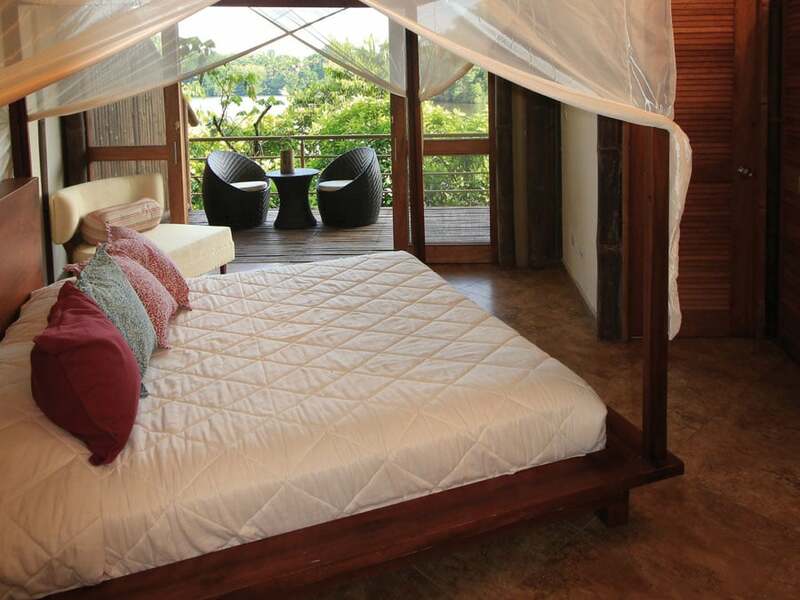 La Selva Lodge • Use the form below to contact us directly. 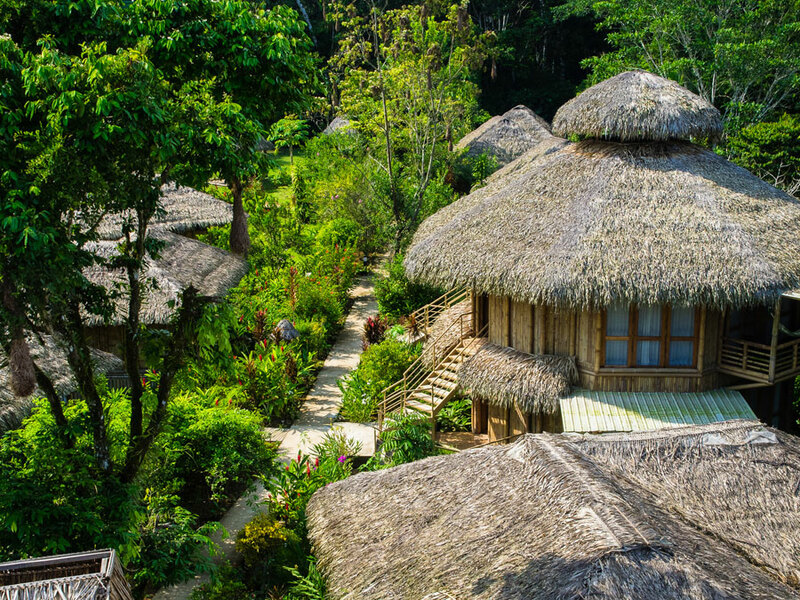 Fill in the fields to check availability & reserve direct with La Selva Lodge. 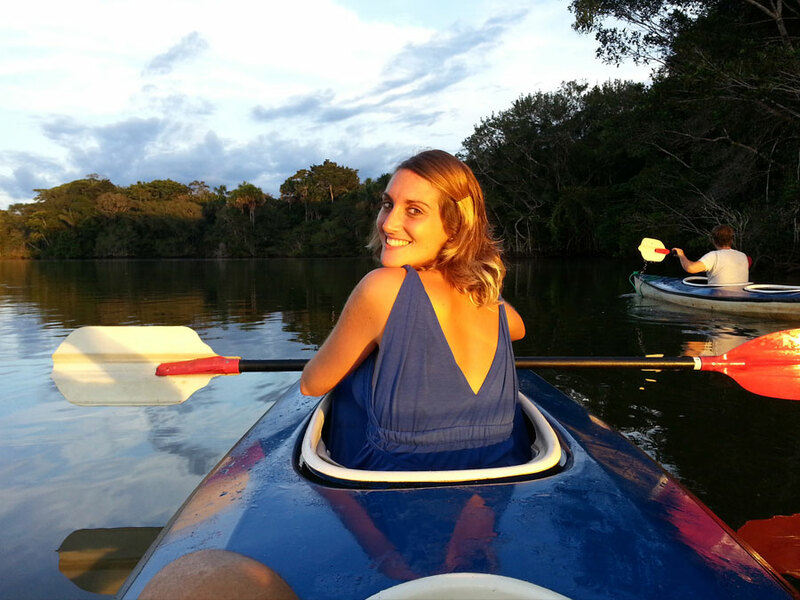 I wanted to let you know that we had an amazing experience at Le Selva! The service, accommodations, guides, tours, transfers, meals…everything, was very well organized and top notch! 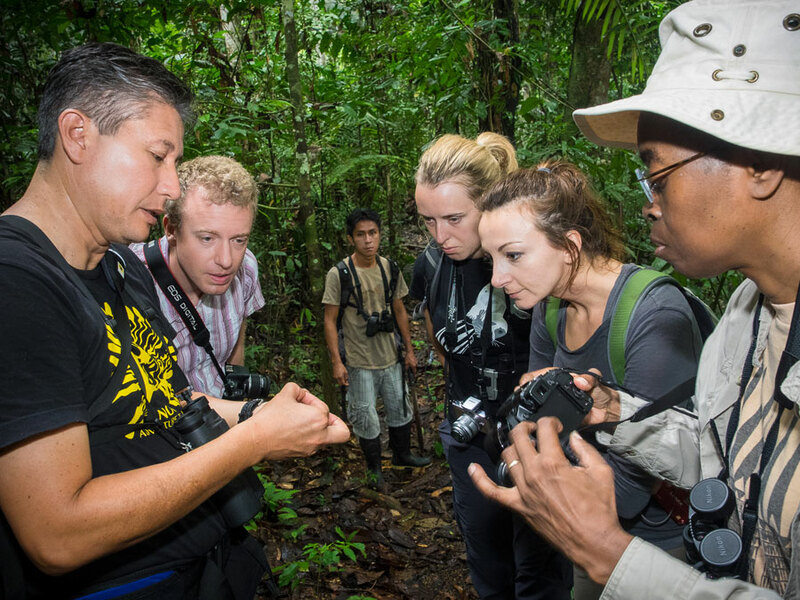 Thank you so much for everything you did to make our Amazon Jungle tour an experience we will cherish forever! 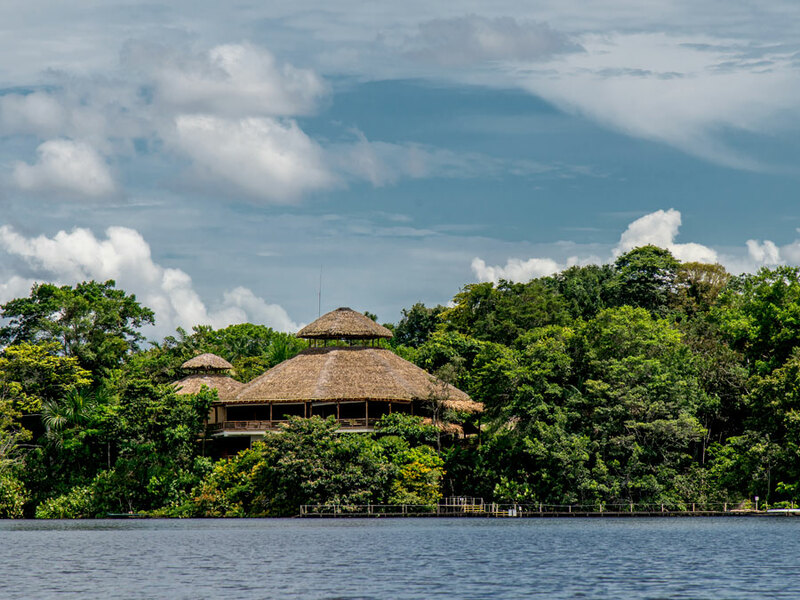 La Selva Lodge is an award-winning Amazon Rainforest lodge in the Ecuadorian jungle and is regarded as the premier eco-lodge in the Ecuadorian Amazon. 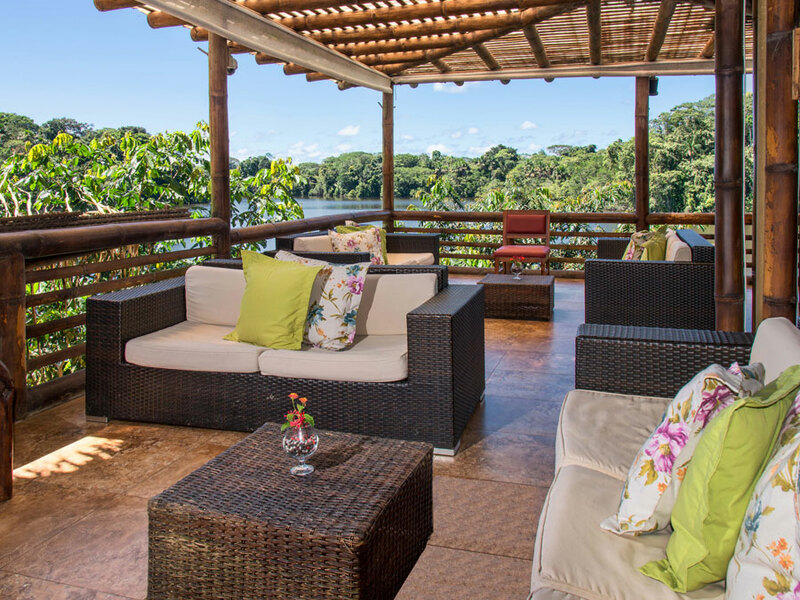 From a comfortable setting, on our La Selva Lodge Amazon tour you will head into the rainforest on guided excursions to see animals and plants of the most wildlife-rich place on Earth. 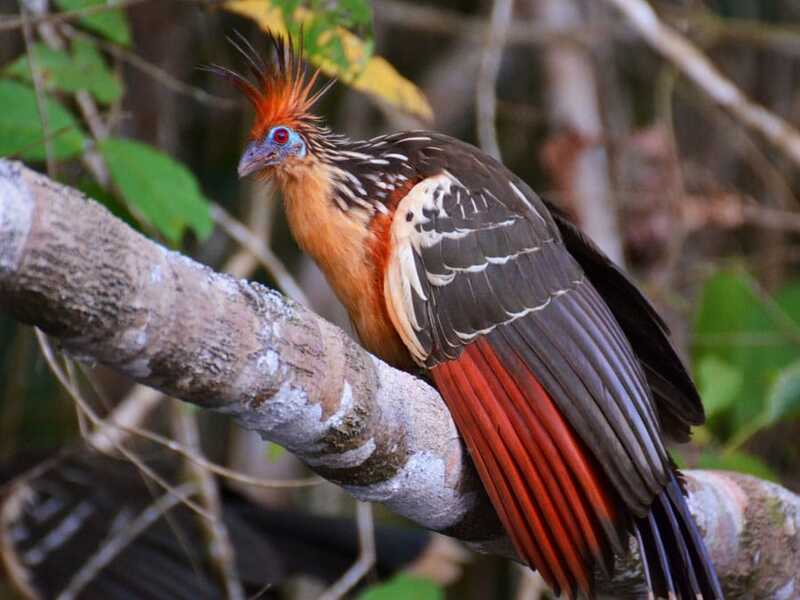 Our guests regularly see parrots, monkeys, toucans, caimans, frogs and much, much more. Enjoy very comfortable guest suites, delicious cuisine, and incredible wildlife. 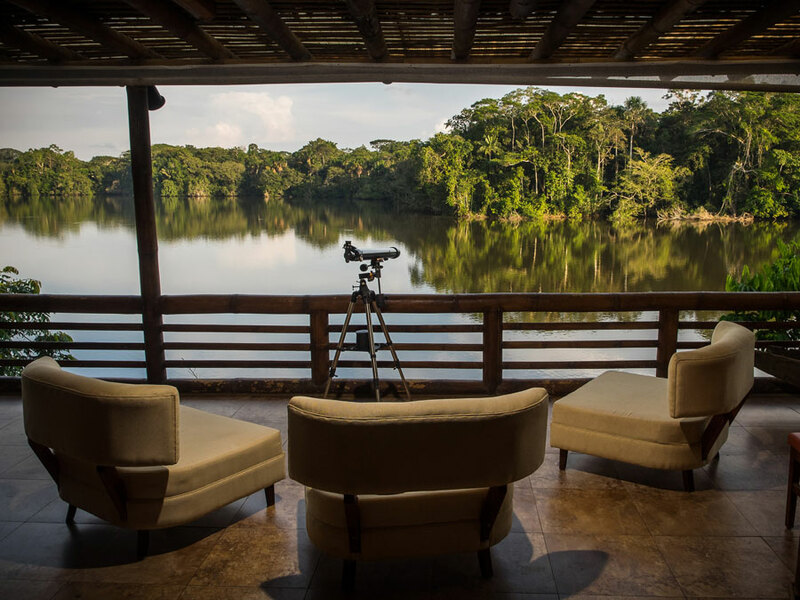 La Selva Lodge overlooks a beautiful Amazon lake, so you can enjoy some fantastic views and even see wildlife from the lodge itself. 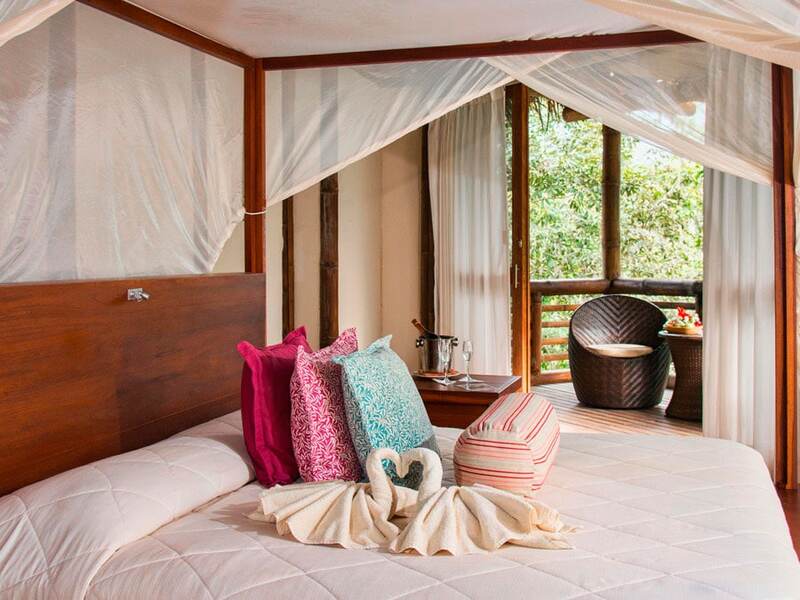 As the lodge is also a spa, you can relax after your rainforest tours with a massage and spa treatment. 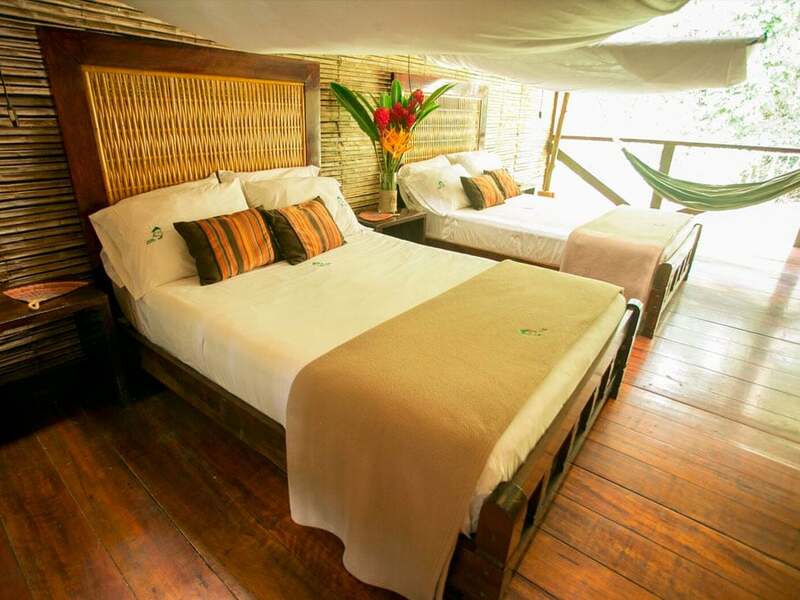 La Selva Lodge has a total of 18 spacious suites with some offering a beautiful view of Lake Garzacocha and some offering family sized accommodation for couples who have brought children. 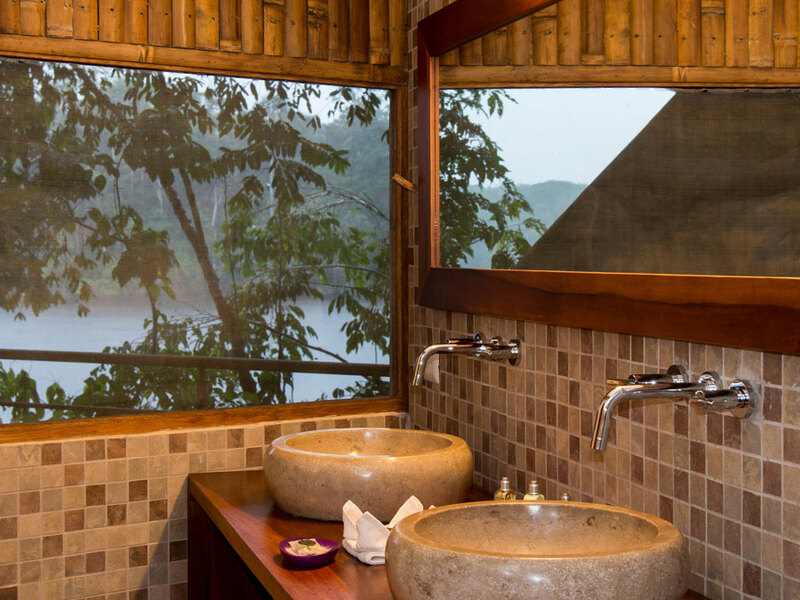 The lodge’s Scenic and Superior suites have private showers, private balconies and offer panoramic views. 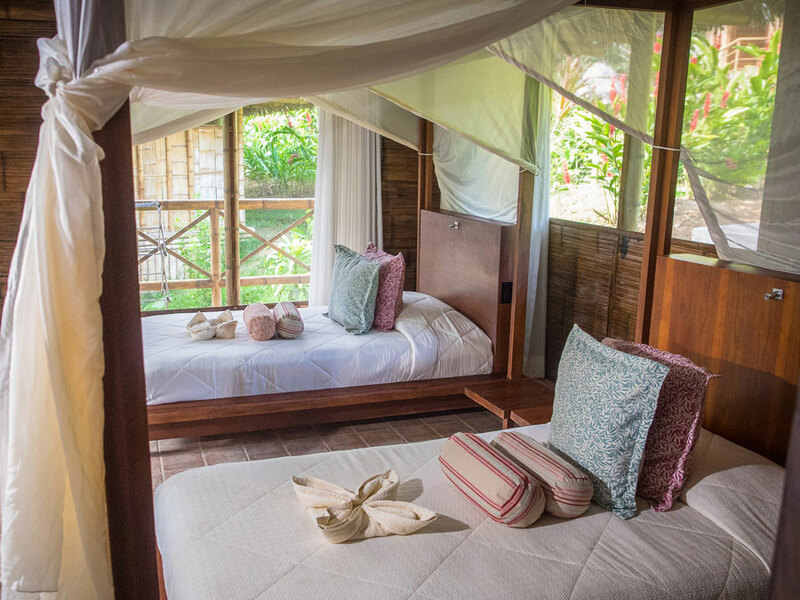 The family suites have extra large bathrooms, hammocks and offer a tub on a private porch. I just wanted to let you know we all really enjoyed our stay at La Selva. Our guides, Paul and Dario were fantastic, the lodge was beautiful and setting stunning. Many thanks again for all your help in booking our stay. We have used native homes to inspire the design of our suites. The design allows free flowing air and shade to keep the rooms cool of a day. Your bathroom includes amenities such as hairdryers and shampoo, conditioner, soap and a sewing kit. Hot showers, ceiling fans and electricity are provided in each suite. 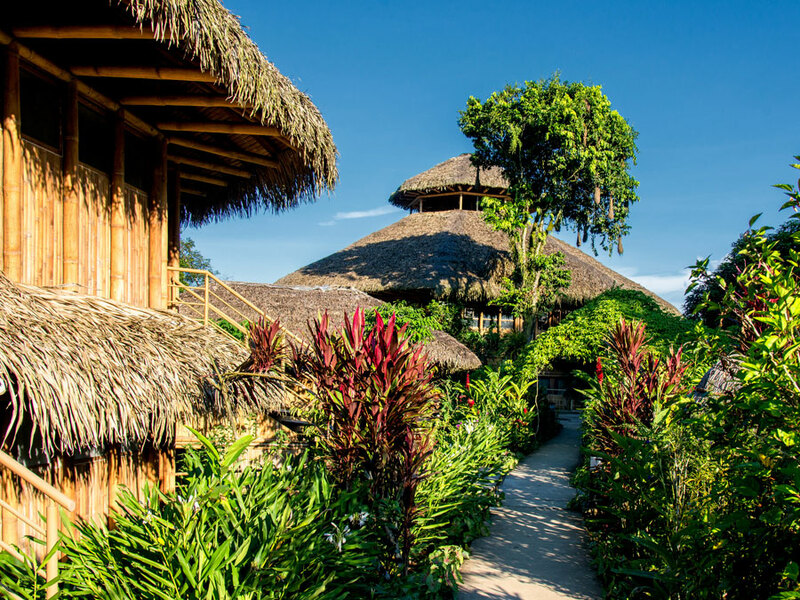 At La Selva Lodge, we are deeply committed to sustainable ecotourism and keeping our impact on the environment to a minimum. Therefore, we do not have air conditioners in the rooms. However, there are large windows and a ceiling fan which keeps the air in the suites circulating. We think you’ll find that the rooms are quite comfortable. As an added bonus, the fans are fairly quiet, allowing you to hear the soothing sounds of the jungle at night. 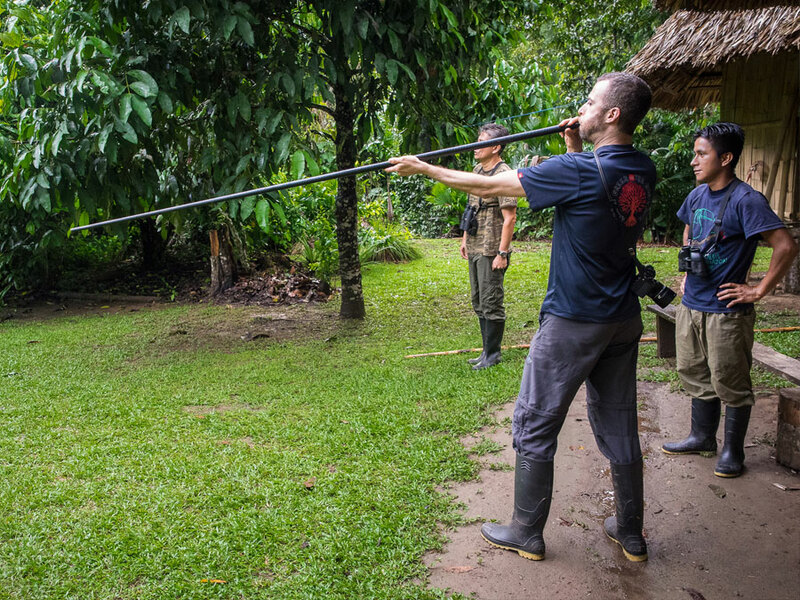 Of a day, you and your group will head out into the Amazon Rainforest led by your English-speaking naturalist guide. 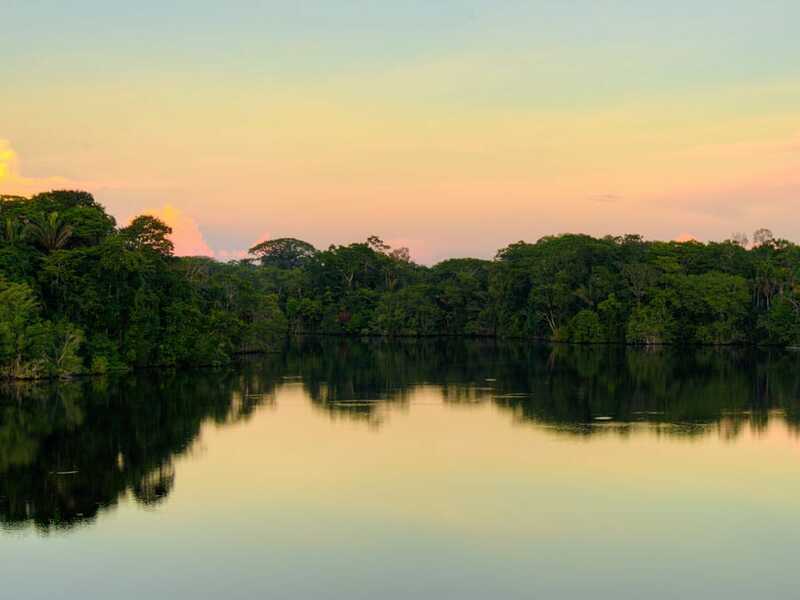 You will explore the lagoon and trails in the rainforest, which is all included in the lodge rate. 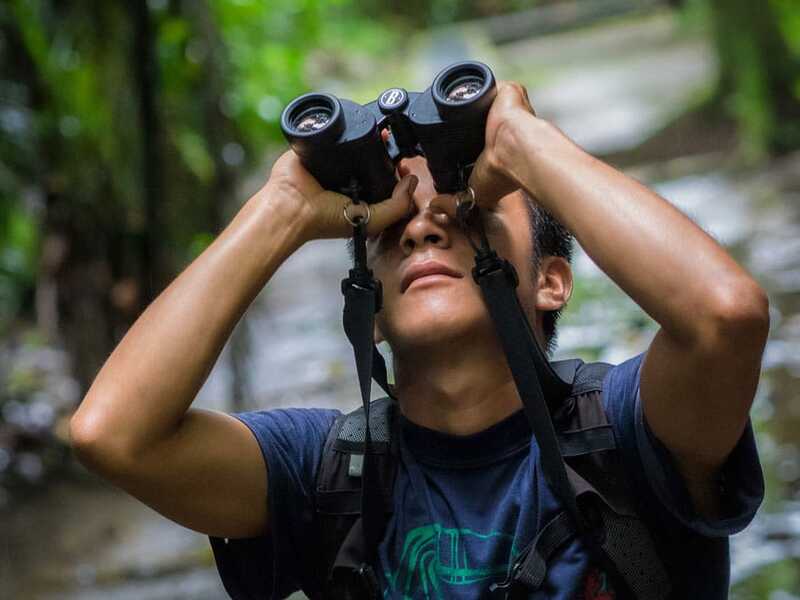 Birdwatching is an exceptional activity at La Selva Lodge and the area surrounding the lodge has been found by ornithological studies to contain more bird species than any other area in Ecuador. 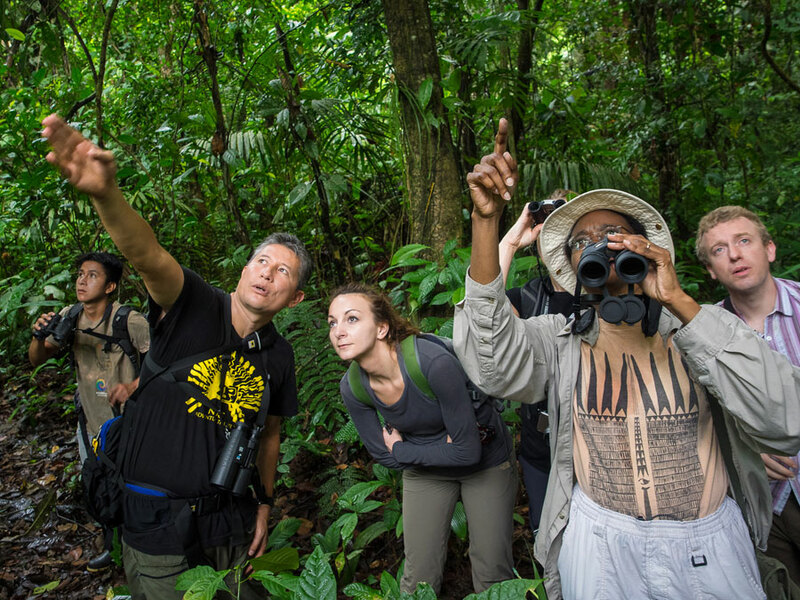 Birdwatchers come from all over the world to see tanagers, parrots, toucans, parakeets, woodpeckers, hoatzins and countless other species. Special birdwatching tours are available. 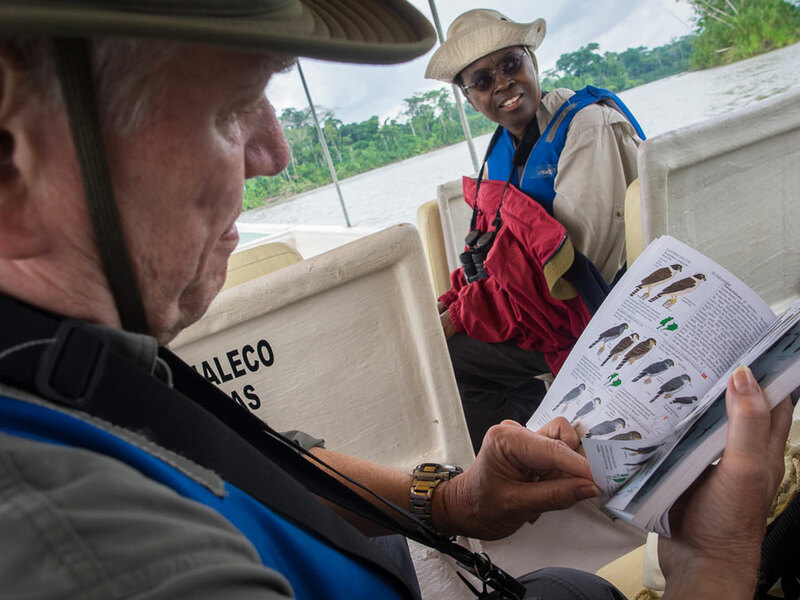 Our Native Guides and English-Speaking Naturalists will guide you through an extensive trail system filled with wildlife in what many consider the most biologically-diverse lodge in the entire Amazon. 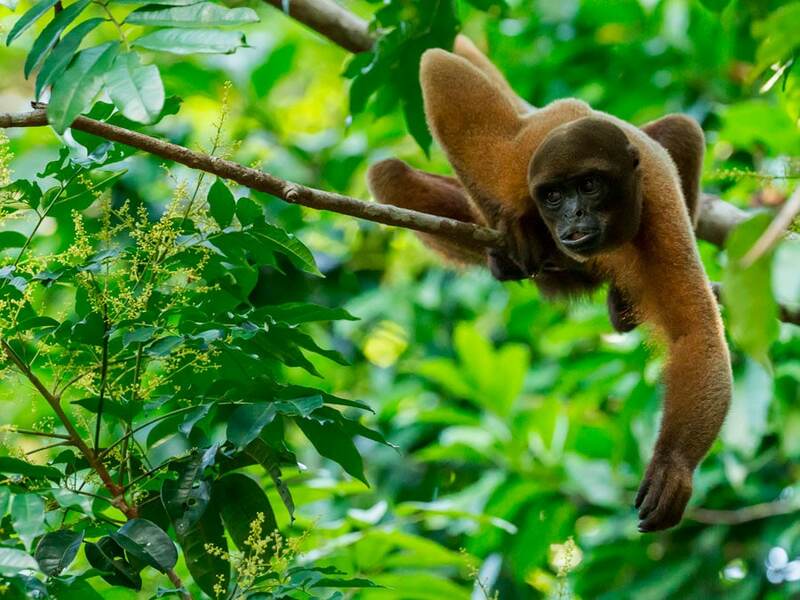 One walk through the virgin forests and you’ll already appreciate the Giant Kapok Tree (Ceiba Pentandra) and the Strangler Fig Tree (Ficus sp), among the most representatives, along with some other plant and animal species that can be seen. 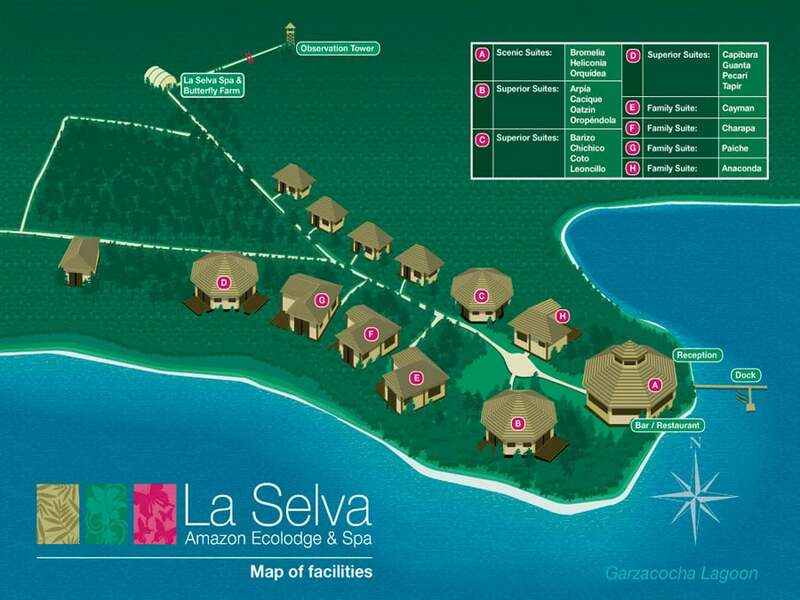 At La Selva, we believe in responsible eco-tourism and mutually beneficial relationships with local communities. Our guests have the unique opportunity to interact with local wildlife as well as local people in a responsible, sustainable way. Note: all of these activities are completely included in the price. There is no extra charge for any of them! Strangler Trail: This trail gets its name from the famous strangler fig (Ficus Aurea, in Spanish “Matapalo”), a remarkable plant which grows up around another tree, choking it in the process (don’t worry: the strangler figs aren’t interested in people!) This educational hike is one that our guides often like to start with, because there are many interesting plants and animals that are found along the trail. 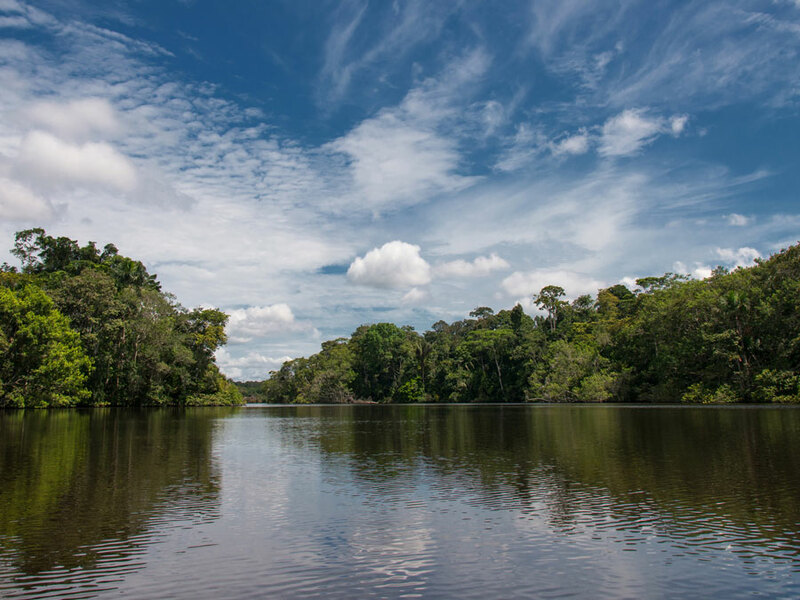 Chaguamango Trail: This trail begins at the lodge, winds through the dense rainforest and ends up at the lagoon, where the canoe will be waiting for you. 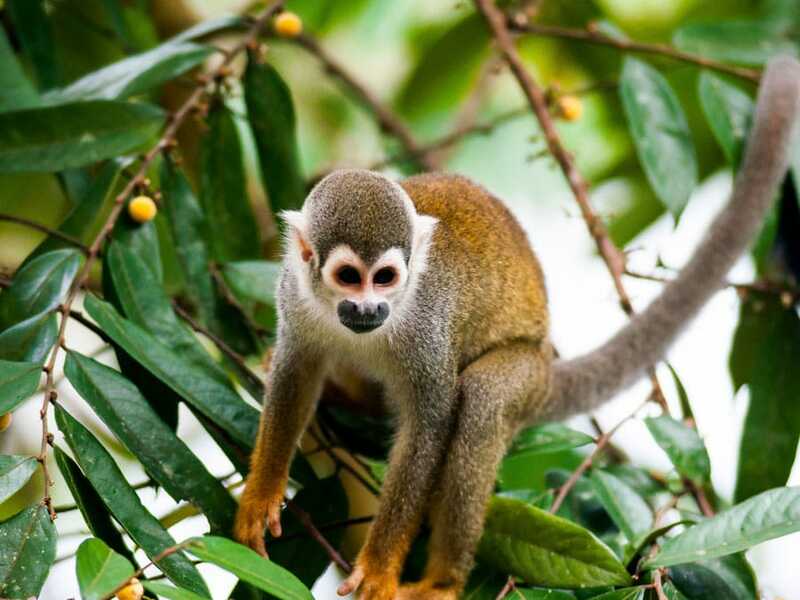 You’ll see the usual plants, frogs, snakes and insects along the trail, and if you’re lucky, a troop of squirrel monkeys will pass overhead! A favorite of our guests. Rainforest Canopy Observation Tower: It’s a whole different world up there! The rainforest canopy is an ecosystem in and of itself. High up in the treetops, birds rule. Built around a massive, centuries-old tree, our 120 foot high (37 meters) observation tower and deck offer a 360° view for world-class birdwatching (and monkey-watching) any time of the day. As an added bonus, there are two trails from the lodge to the tower: a 20 minute “express route” and a two-hour “scenic route.” Both trails are great for seeing animals and medicinal plants used by locals for centuries. One of our can’t-miss activities! Charapa Trail: the Charapa Trail goes from the butterfly farm along a winding path that most groups can walk in about an hour and a half. At the end of the trail, you arrive at the lagoon, where the canoe will be waiting to return you to the lodge or explore Lake Garzacocha. 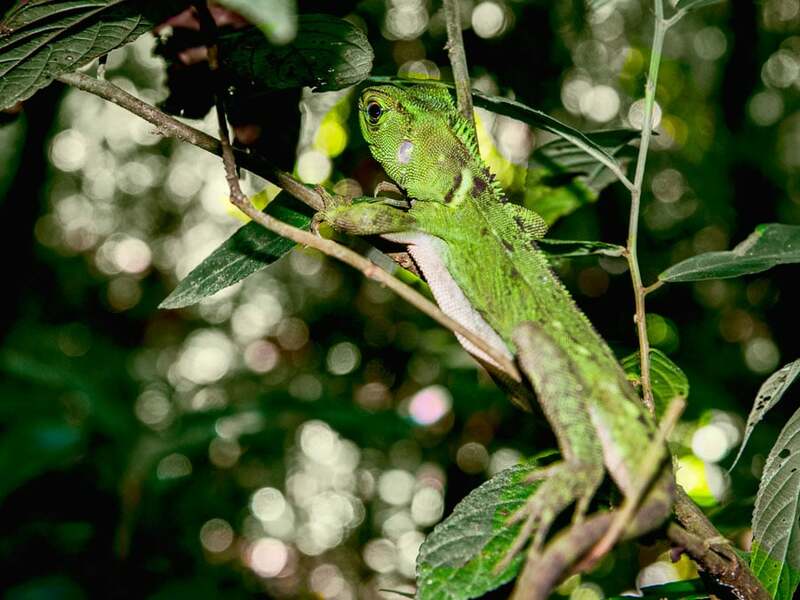 You can never tell what sorts of birds, reptiles, frogs or monkeys you might see on this trail, so keep your eyes peeled! 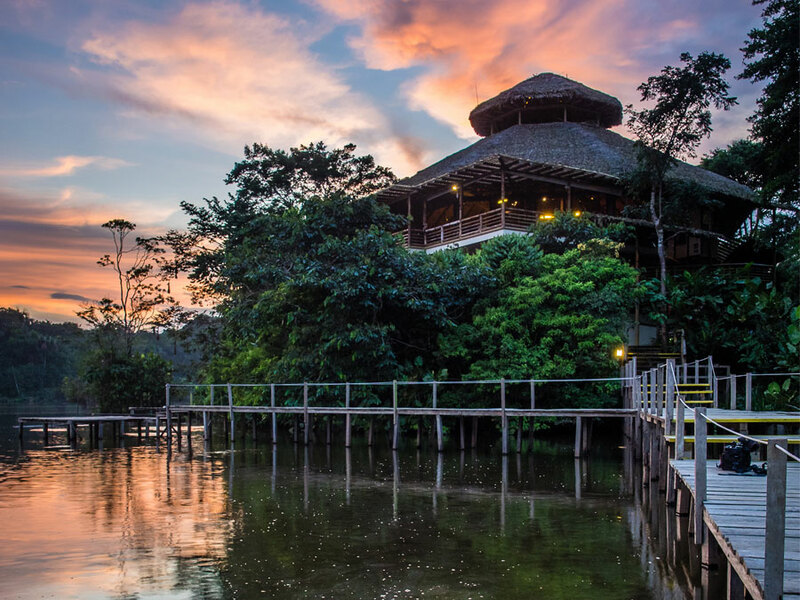 If you’ll lucky, you’ll catch a magnificent Amazon sunset over the lagoon on your way back. 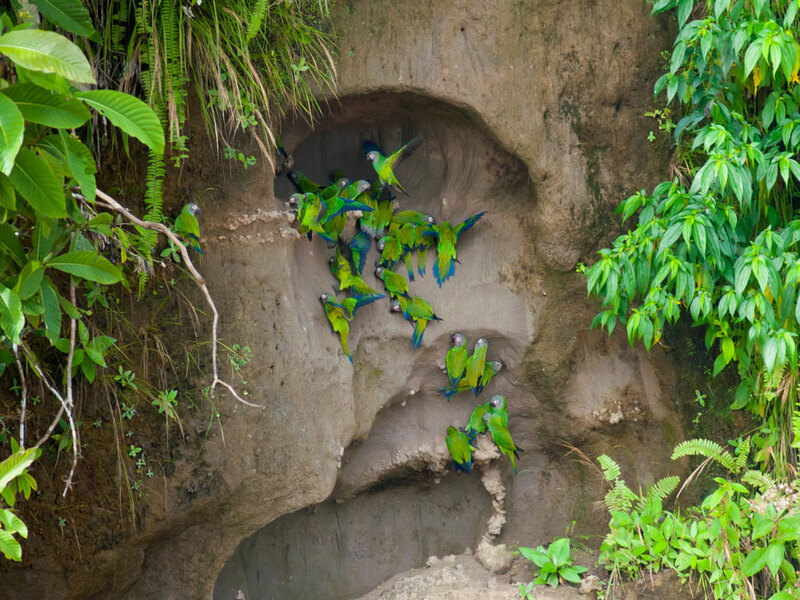 Parrot Clay Lick: Because of their diet, Amazonian parrots frequently need to eat salty clay to aid their digestion. There are some of these famous “clay licks” near the lodge and they are a favorite of our guests. On a good day, you can see hundreds of brightly-colored birds fluttering about the clay and squawking loudly all the while. Community Cultural Visit: Several indigenous communities live near the La Selva Amazon Ecolodge. Our guides like to take our guests there, because the communities are always excited to receive visitors and our guests enjoy seeing another way of life – the Amazon way. 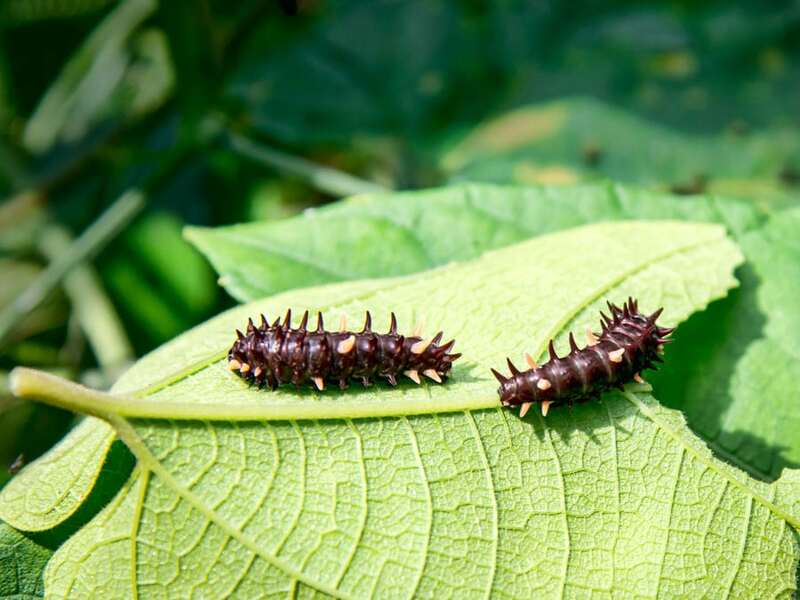 You might visit a local home or school, see some of the projects the locals are working on, try local foods and drinks (roasted wood grubs, anyone?) and even shoot a blow dart gun! A highlight comes at the end of the tour, when guests have the opportunity to purchase hand-made handicraft souvenirs directly from the people of the community. 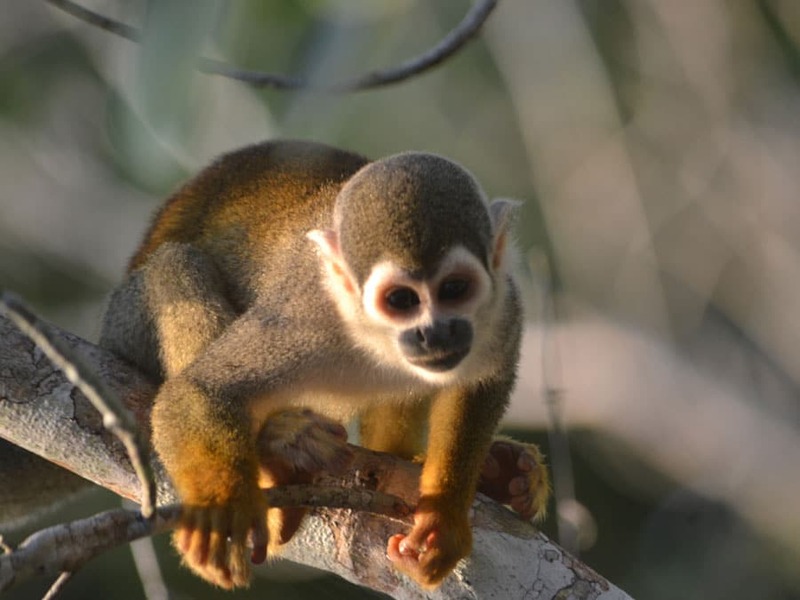 Marmoset Trail: The part of the jungle where our lodge is located also happens to be the habitat of the rare Pygmy Marmoset, the smallest monkey in the world. There is a family of them located not far from the lodge and a canoe ride and short walk will get you to a place where they are often, but not always, seen. The “Leoncillos,” or “Little Lions” as they’re known to locals, is a bucket-list sort of sighting for many of our guests. 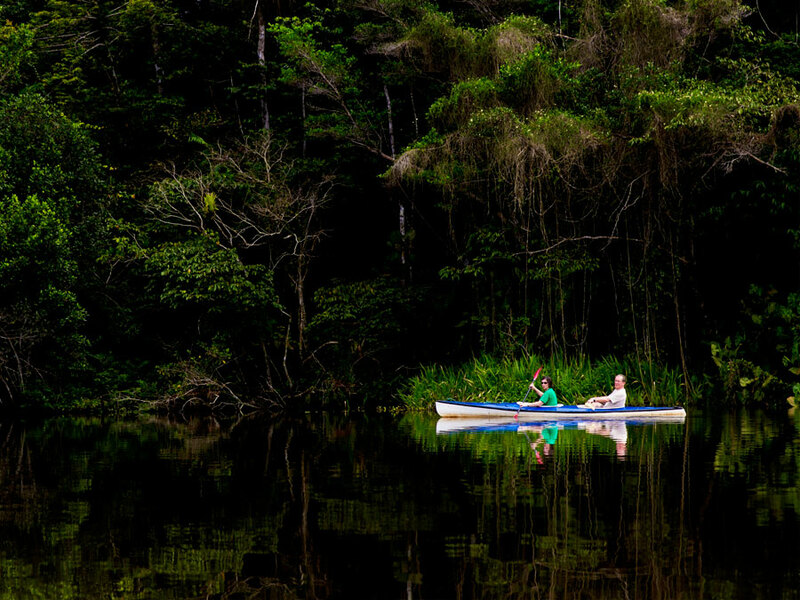 Canoe Rides in the Creeks and Garzacocha Lagoon: Bodies of water are often the best places to see wildlife in the Yasuní Biosphere Reserve. Our traditional, hand-paddled canoes are the travel medium of choice on the lagoon and along the creeks that come in and out of it. 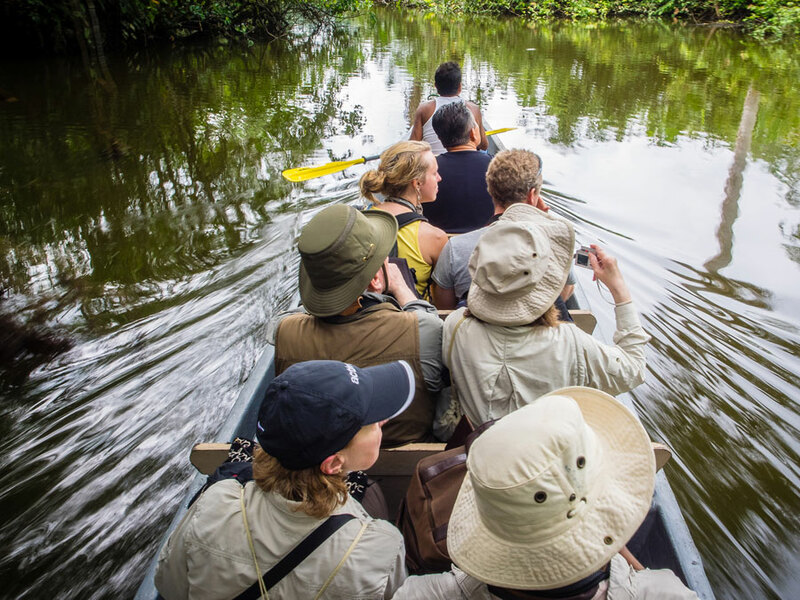 You might see a paiche (a massive fish that occasionally likes to snap at the paddles), snakes (including the legendary anaconda), bats, any number of birds and monkeys, and much, much more. Relaxing and fun, many guests tell us that the canoe rides were their favorite part of their stay with us. Sacha Hugra Trail: Our longest and most challenging trail is also our most spectacular one. The Sacha Hugra trail goes for four to five hours through some of the only surviving original primary rainforest in the area. It’s your best chance to see some of the larger, more spectacular wildlife. The trees, ancient and magnificent, tower above the rainforest floor like nowhere else: you can tell in the air that this place is old and timeless. If guests find it challenging or are pressed for time, they can choose to do only a portion of the hike. Night Walk: Many of the most interesting species near the lodge are nocturnal and can only be seen at night. Grab your flashlight and join your guide and fellow travelers on a brief walk to see toads, frogs, insects, bats, scorpions and other varmints that are invisible by day. A favorite of kids! Night Canoe Ride: Your guides will take out a canoe and a spotlight onto the lagoon to try to spot some fantastic wildlife, including caimans, snakes, bats, owls and anything else lurking around the lagoon in the darkness. 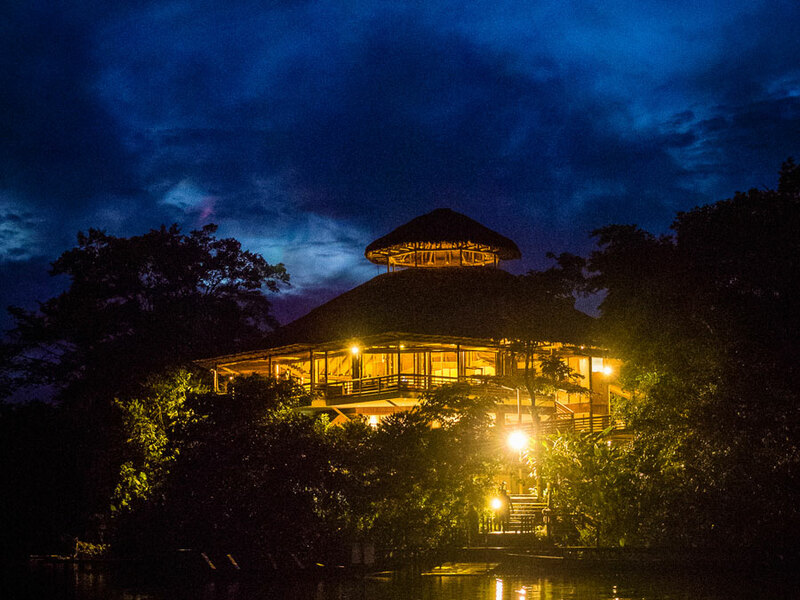 They’ll try for a clear, cloudless night if possible, because the stargazing from the center of the lake in the Amazon night is truly memorable. Fishing: Imagine updating your online profile with a photo of yourself…holding a piranha you just caught off our dock! Every day around two o’clock, the native guides will help you catch and release these legendary fish right in front of the lodge. Explorer Kayaks: Many of our guests can’t get enough of the wildlife around our lagoon, Lake Garzacocha, so we keep some kayaks handy near the dock. You can take off on your own exploration adventure whenever you wish! Swimming in the Lagoon: Want to take a cooling dip in our freshwater lagoon? Feel free to suit up and jump in whenever you want: all we ask is that you let us know so we can have someone close by to keep an eye on you. 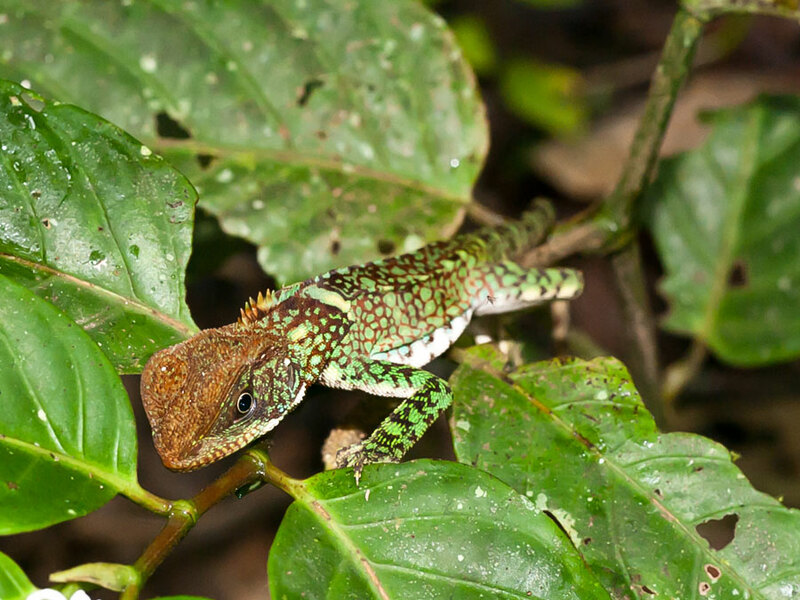 Combination Tours: Combining a trip to La Selva with a visit to the legendary Galapagos Islands results in a truly unique and extraordinary wildlife tour. 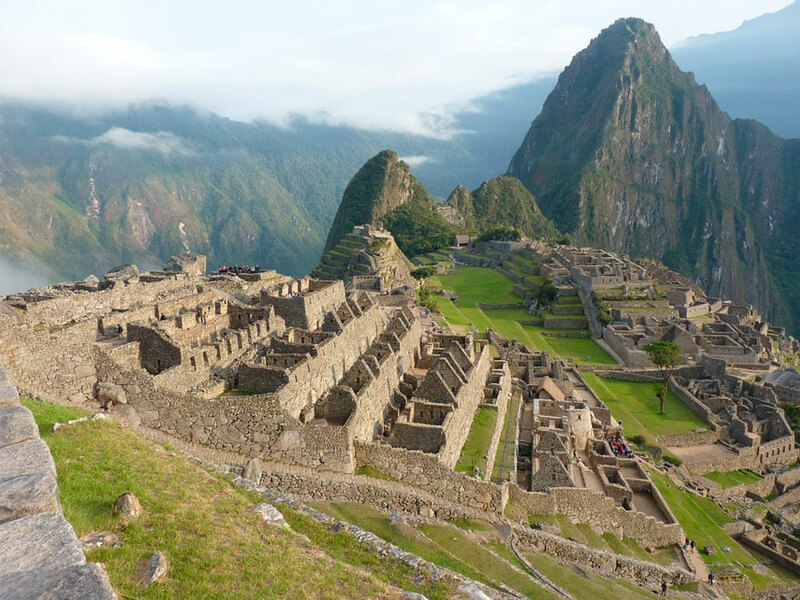 Contact our representatives to combine your rainforest tour with a trip to Galapagos, Machu Picchu, the native markets of Ecuador or other adventure! Children under 12 years old, 30% off.